Sounds like 1968 Creative Creation marbles. I’m pretty sure they were checklisted in the standard catalog at one point. Last edited by docpatlv; 09-16-2018 at 01:04 PM. Thanks for the info - I looked at the 2008 SCD Catalog I have and found them under 1968 Official Major League Players Major League Marbles. I gather the one guy who said Creative Creations used this write-up. The only problem I have is no where does it list how many colors were made (maybe only one color per player) and whether there were big heads and small heads. I am bidding on a Rich Nye (big head) or presume there were both big and small? I have never seen color variations of players. I have owned multiples of a number of the players. I didn't pay close attention to the size of their heads, but do not recall variations in them either. There were either 5 or 6 different packages(despite advertising 24 series) like the one shown above. 20 marbles per package (listed on the packages as "series") that would put a set at either 100 or 120. You used to be able to find them once in a while on unopened packages like the one shown. Those seem to be buried in collections as I can't recall the last time I saw one publicly offered. Hope that helps. Some bigger names - Clemente, Mays, Rose - no Mantle. Last edited by hcv123; 09-17-2018 at 07:09 AM. I have never seen color variations of players. I have owned multiples of a number of the players. I didn't pay close attention to the size of their heads, but do not recall variations in them either. There were either 5 or 6 different packages(despite advertising 24 series) like the one shown above. 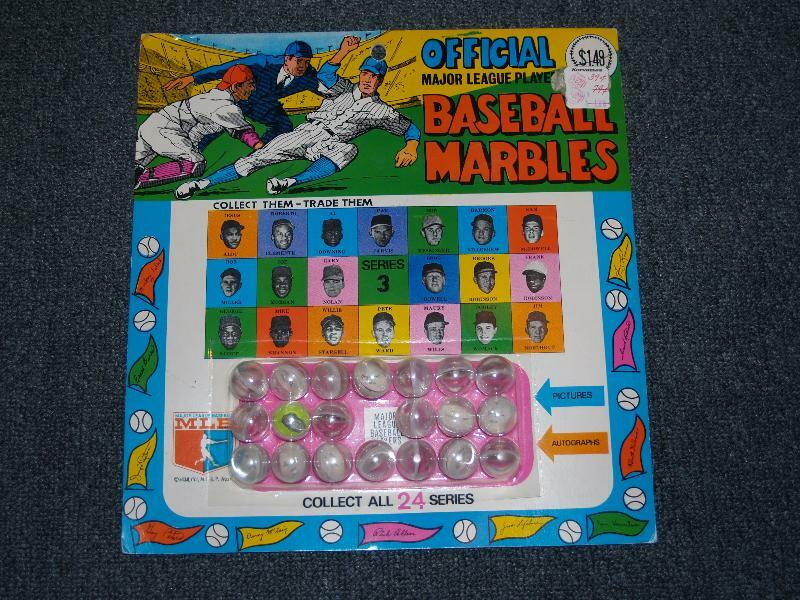 20 marbles per package (listed on the packages as "series") that would put a set at either 100 or 120. You used to be able to find them once in a while on unopened packages like the one shown. Those seem to be buried in collections as I can't recall the last time I saw one publicly offered. Hope that helps. Thanks, appreciate the info - I guess that means the players were printed with different colors but only one color to each player. I have bid on the Nye big head and have a Nye on hand, so if I get it, I will post pictures if they are different. Thanks again. I ran across a set of these yesterday while cleaning out my closet. They apparently are my husbands that he picked up at a garage sale when he was a kid. Theres quite a few including a rich nye. My husband asked me to get a feel as to how much these are going for. Any help would be great, thank you! This auction was back in 2013 so its not much to go on but it's something. If you google 1968 Baseball Marbles you should come across a checklist with some selling numbers, i.e., person wants 44.95 for Kaline, 14.95 for Freehan,9.95 for Aspromonte, etc. Quite a few not listed for sale. If you can't find it post back and I will send it to you. I got the auction and it definitely was a big head - both in yellow. I remember seeing that display back in '68 and how my eyes lit up when I realized that if I was lucky enough I could get a Dooley Womack baseball marble. Shivers run up my spine now just thinking about it. Well, if the display from Huggins and Scott is to be believed, there are 24 series of 20 each. That should mean there are 480 different. I don't have the checklist, so I wonder if that many were actually produced. The checklist I have (SCD Vintage BB Cards 3rd edition) says "while the packaging says "Collect all 24 Series" only 120 marbles were actually issued" It also does not mention anything about Big or Small heads or any other variation - so I wonder also how many there actually are? Firstly - based on my experience, I believe the set to be complete at 120 - 6 packages with 20 marbles per package. Regarding the "big head" - take a real careful look from different angles (through different parts of the clear marble) understanding that the paper inside may be situated in a different place in each one - if I recall correctly certain parts of the marble have a magnifying type effect. For sure the pictures you posted are very different angles. Thanks, I will re-look and get back to you. The package says some are autographed, how would that work? They are pretty cool , I wonder if my old pogs will ever be collected. I have re-looked and turned them every which way. The Nye definitely has a big and small head. Last edited by cubman1941; 10-07-2018 at 06:17 AM. Thanks for sharing. Can you tell if any of the marbles are a big head? I have started my research project to little avail. Jim, I know this issue pretty well. I actually bought some when they were issued. I sure these "big head" marbles are not variations. This is a very low tech item. Some of them had the placement of the player either higher or lower than the middle of the marble, thus the "big head" appearance. That's my opinion anyway. Thanks guys, I appreciate it and it makes a lot of sense. Well - found a checklist!! 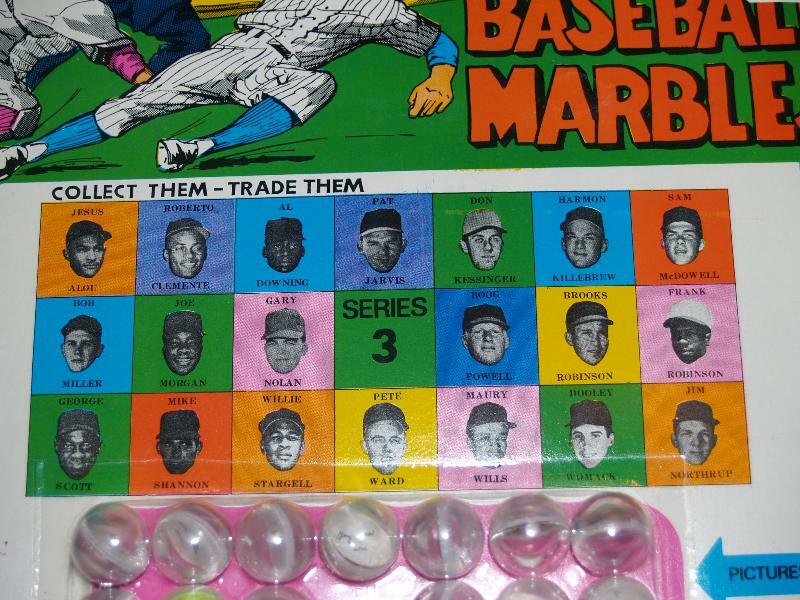 Sorry for any type'o's - Typed quickly - as previously mentioned - complete at 6 series and 120 marbles - assuming it was 1968 - Mantle is noticeably absent? Wow. I never saw the marbles when I was growing up, but I did collect a few of the rubber balls from that same timeframe and which were about the same size. Thanks much. I have printed the list off and will add it to my book. Appreciate it. I have Series 5 with no particular personal attachment. I am certainly open to selling it. Last edited by danno561; 12-27-2018 at 04:47 PM. Found this site that references “big heads” and “small heads”. Last edited by danno561; 12-27-2018 at 06:05 PM. Thanks a whole bunch. Interesting that I know this site bidding on his auctions but never looked at his vintage stuff. Appreciate it very much. No Cubs in Series 5 or I would inquire further. Thanks.